When the Duke and Duchess of Cambridge, William and Kate, announced today the name of their infant daughter: Princess Charlotte Elizabeth Diana, I immediately thought of another Princess Charlotte, the one who would have been queen instead of Queen Victoria. 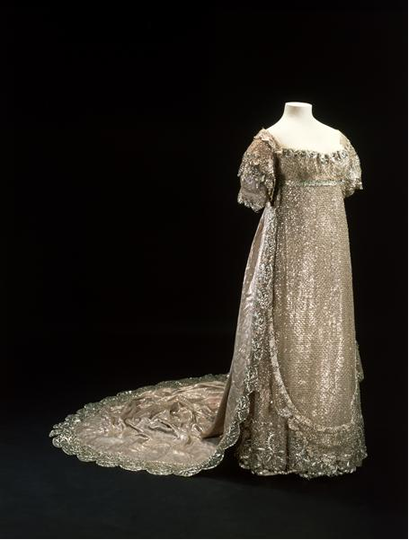 Princess Charlotte wore a silver dress for her marriage to Prince Leopold in 1816. Though far more sparkly than Louisa’s, Charlotte’s dress gives a potential costume designer an example of what Louisa’s dress style and color might have looked like. Princess Charlotte was the eye of England. She was the only legitimate heir to the Prince Regent and future King George IV, the oldest son of King George III, who was king when America declared Independence from England in 1776. Charlotte was well on the path to become Queen Charlotte after her father’s death. As a royal princess and direct heir, Charlotte was expected to provide a future heir to the throne. All of England waited in expectation during her pregnancy in 1817. Maternal and infant mortality rates were high back then. Charlotte died after giving birth to a stillborn. When a baby dies inside the womb, the mother is at a higher risk of developing an infection. With the lack of antibiotics, the mother often died. Such was the case with Princess Charlotte. King George IV died in 1830. His brother became King William IV, who died in 1837. Because all of William’s brothers had passed away, the crown transferred to another strong woman, his niece, Victoria, Charlotte’s cousin. Queen Victoria ruled England for 63 years. She was married to Princess Charlotte’s nephew, Albert, the nephew of Prince Leopold of Belgium. The new princess Charlotte Elizabeth Diana has two other family names. She is the granddaughter of Queen Elizabeth II. Like her great, great grandmother Queen Victoria. Queen Elizabeth has ruled for 63 years. Princess Diana was Princess Charlotte’s grandmother. Because so many decades have passed since Princess Charlotte of the Regency era, Britain’s new Princess Charlotte enjoys the blessing of family names while having a distinctive first name without modern comparisons. She has the freedom to blaze her own trail. Blessings to her. This entry was posted in Uncategorized and tagged American Phoenix, Charlotte Elizabeth Diana, Princess Charlotte, Princess Diana, Queen Elizabeth, Royal baby name, William and Kate. Bookmark the permalink.